"Contradiction #23: Deity Did Not Die"
"Contradiction #23: Divinity Didn't Die"
Robert K. Sanders alleges that Ellen White contradicts the Bible more than 50 times. The following is #23 from the revision of his document dated June 2002. 23. DID JESUS' HUMANITY AND DIVINITY DIE ON THE CROSS? EGW: YES "In him dwelleth all the fullness of the Godhead bodily. Men need to understand that Deity suffered and sank under the agonies of Calvary." (Manuscript 44, 1898, and the Seventh-day Adventist Bible Commentary, vol. 7, p. 907). EGW: NO "The Deity did not sink under the agonizing torture of Calvary" (Letter: 1899, quoted in the Seventh-day Adventist Bible Commentary, vol. 5, page 1129). BIBLE: YES "We believe that Jesus died and rose again" (1Thessalonians 4:14). NOTE: The Bible repeatedly states that Jesus, the total Person, died on the cross. Four of the first heresies Christianity faced (Appolinarianism, Arianism, Docetism and Nestorianism) denied that Jesus was fully human and fully Divine as a person. Orthodox Christianity maintained the complete unity of Christ's nature in both His life and death. Thus Ellen White not only contradicted the Bible and orthodox Christianity, she also contradicted herself. Please excuse the wrong references, the missing "32" in the phrase "Letter 32," and the improper italics. We aren't tampering with Sanders' document to make him look bad. Honest. All such mistakes are his, not ours. As in #15, Sanders gives the wrong reference for the second quote. Letter 32, 1899 should be Manuscript 140, 1903. Additionally, the first reference should be Manuscript 153, 1898, not Manuscript 44. The latter is the correct reference for the two paragraphs immediately following the one in question, but the quote Sanders gives is clearly marked as coming from Manuscript 153. We find it odd that Sanders would claim that Ellen White contradicted herself and the Bible, without giving any quotes or verses to substantiate such a claim. Note that the quote and Bible verse given say absolutely nothing about whether Christ's divinity died or didn't die. We were able to find a third quote speaking about the Deity sinking or not sinking, and that quote did indeed address the issue of the Deity dying. Below we give you all three quotes in their complete context, bolding the phrases that speak of Deity sinking or not sinking. "In him dwelleth all the fulness of the Godhead bodily." Men need to understand that Deity suffered and sank under the agonies of Calvary. Yet Jesus Christ whom God gave for the ransom of the world purchased the church with His own blood. The Majesty of heaven was made to suffer at the hands of religious zealots, who claimed to be the most enlightened people upon the face of the earth (MS 153, 1898).—Seventh-day Adventist Bible Commentary, vol. 7, p. 907. There is no one who can explain the mystery of the incarnation of Christ. Yet we know that He came to this earth and lived as a man among men. The man Christ Jesus was not the Lord God Almighty, yet Christ and the Father are one. The Deity did not sink under the agonizing torture of Calvary, yet it is nonetheless true that "God so loved the world, that he gave his only begotten Son, that whosoever believeth in him should not perish, but have everlasting life. "—Letter 140, 1903 in Seventh-day Adventist Bible Commentary, vol. 5, pp. 1129, 1130. Was the human nature of the Son of Mary changed into the divine nature of the Son of God? No; the two natures were mysteriously blended in one person—the man Christ Jesus. In Him dwelt all the fullness of the Godhead bodily. When Christ was crucified, it was His human nature that died. Deity did not sink and die; that would have been impossible. Christ, the sinless One, will save every son and daughter of Adam who accepts the salvation proffered them, consenting to become the children of God. The Saviour has purchased the fallen race with His own blood.—Letter 280, 1904 in Seventh-day Adventist Bible Commentary, vol. 5, p. 1113. The first quote appears to be addressing a different issue than the last two. The first one appears to be affirming the fact that Deity suffered on Calvary, while the last two deny the idea that Deity died on Calvary. The charitable thing would be to assume that Ellen White is using "sink" to mean two different things in these three quotations, unless evidence to the contrary turns up. In the first quote she is talking about sinking in the sense of suffering. In the last two she is talking about sinking in the sense of dying. Most pitiable is the condition of one who is suffering under remorse; he is as one stunned, staggering, sinking into the dust.—Special Testimonies, ser. A, no. 9, p. 6. Again [Mary's] heart would sink as she recalled the words in which He had foretold the very scenes that were then taking place. . . . Would He who had given life to the dead suffer Himself to be crucified? Would the Son of God suffer Himself to be thus cruelly slain?—Desire of Ages, p. 744. We do not see how we could ever prove in court that Ellen White was contradicting herself. Robert Sanders is considered by many to be an expert on Seventh-day Adventism, since he was a member for so many years. He therefore is likely familiar with the fact that some early Seventh-day Adventist writers were uncomfortable with certain speculations of nineteenth-century Trinitarians. Some of what these Adventist writers wrote is quoted by modern anti-Trinitarians to bolster the claim that the Trinity doctrine is of the devil. The Trinitarian view, I think is equally exceptionable. They claim that the Son of God had three distinct natures at the same time; viz., a human body, a human soul, united with his Divine nature: the body being mortal, the soul immortal, the Divinity co-equal, co-existent, and co-eternal with the everlasting Father. 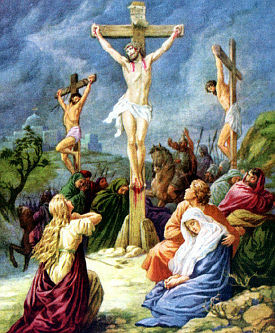 Now, none of the advocates of this theory, claim that either his soul or Divinity died, that the body was the only part of this triple being which actually died "the death of the cross;" hence, according to this view (which makes the death of Christ the grand atoning sacrifice for the sins of the world) we only have the sacrifice of the most inferior part — the human body — of the Son of God.—Advent Review, Nov. 21, 1854. While similar sentiments regarding Deity dying on the cross can be found in the writings of long-time Seventh-day Adventist minister J. H. Waggoner, it is difficult to find lots of other Seventh-day Adventist authors who agreed. It appears that this teaching of Stephenson and Waggoner that Divinity died was not all that popular among Adventists. Dr. Barnes, as quoted, says that "the divine nature in the person of Christ" could not suffer, nor die . . . . The Manual of Atonement, as quoted, says he could only die as man; that in his divine nature he could neither suffer nor die . . . .
Dr. Scott, who says his death was only in his human nature . . . .
Dr. Clarke thinks it was the human, not "the divine nature of our Lord" that died . . . .—"The Atonement," Advent Review, Nov. 10, 1863. Talk to enough anti-Trinitarians today, and you'll find someone who claims that Christ's divinity died on the cross, and that this is proof that the Trinity doctrine is wrong. This leads us to wonder whether Sanders believes in the Trinity or not. If he denies the Trinitarian view that Deity did not die, does he believe in the Trinity? It was not the Second Person of the Trinity that died on Calvary's cross, for God cannot die. It was the man Christ Jesus whose precious, sinless blood was shed there to reconcile mankind to God.—Heresies of Catholicism. Nowhere can we find any disclaimer by Sanders saying that Schroeder is wrong and is contradicting the Bible in making such claims. Rather, Sanders ends this web page by telling folks where they can buy Schroeder's book. This is really odd. If Sanders condemns Ellen White's view that Deity did not die on the cross, a view that harmonizes with the views of Trinitarians, why does he also post on his site material endorsing that very view? Is it at all possible that Sanders has decided that Ellen White was right on this one after all, that Deity did not die on Calvary? If so, then why hasn't he corrected his "Contradictions" document? Deity did not die: What do you think? Honestly, I think Ellen White and Trinitarians are wrong on this one. I think Deity died on Calvary. My opinion is that Ellen White always meant "died" whenever she used the word "sink." There are no exceptions. Sanders is obviously confused. He ought to shut down his web site until he can figure out what he believes. I believe that Ellen White is correct: Christ's human nature, not his divine nature, died on Calvary.